What interests me are 2 miles/dollar on every purchase and relatively low annual fee. Currently, the travel card I have is the Citi ThankYou Premier Card which just replaced my old PremierPass Elite card. Since it is a replacement card, I got to avoid the $125 annual fee that it normally charge. 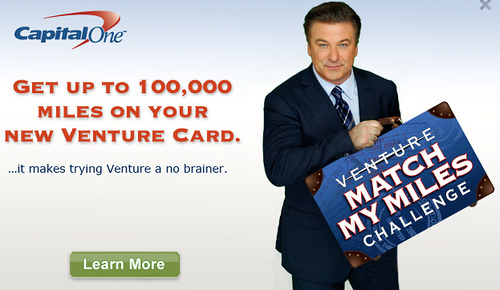 Also with the Premier Card, I only earn 1.2 Points for every dollar, half of what the VentureOne Card. For these benefits, I probably won’t consider the VentureOne Card given how much I dislike Capital One, despite that the card gives more miles than any other travel rewards credit card I know. But then yesterday, I saw on FatWallet forum that Capital One is now having a ” Venture Match My Miles” challenge and the event, which will match up to 100,000 miles, actually makes the card looks much better. 100K miles, though Venture Miles, not specific to any airline, seem a very good offer. Speaking of airline rewards credit card, I think I may just get a couple of them for myself. I talked with one of my friends early this week and he told me that he just bought tickets for the whole family to go back to China in July. The ticket price? $1,550 for adult and $1,250 for kid, not even direct flight. That’s a lot of money to spend on just tickets for a family of four! For us, we probably could face the same situation if we would go back next year because, unlike before when we could go at any time, our daughter will start school this fall and we could only take long trip in the summer. The tickets are just too expensive during the summer peak travel season, but we don’t much choice. One possible way to offset the high cost a little bit is to get an airline rewards credit card with big one-time bonus. There are two promotions that I know currently big bonuses. One is Citi AAdvantage Card (1-800-408-4311) with 75K bonus miles and the other is Chase United Mileage Plus (1-800-933-0690) with 50K bonus miles, both need to apply over the phone. Since both AA and United are major carriers in this area, the possibility of using one of them in our next trip is pretty high. I haven’t got any new credit cards in the past three years as I didn’t find anything appealing (well, after all the trouble in the financial industry, credit card offers got a lot worse than before). Instead, I closed a few cards that I no longer need just to keep things a little simple. Now that we have already bought the house and have a low-rate mortgage, I think I can afford to get a couple of new cards, even possibly a hit in my credit score, which was recently close to 800. Did I Misread Discover Miles Card’s Promotion?